This flavor combination will blow you away! 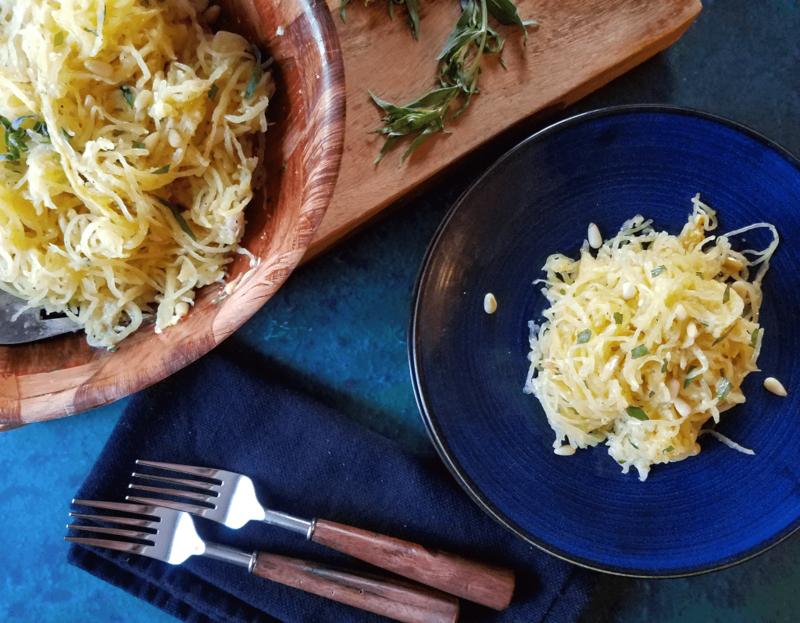 Buttery and fruity parmesan cheese (ideally Grana Padano) is the perfect companion for tarragon and pine nuts, and it’s all mixed together in a healthy, gluten-free and low-carb spaghetti squash dish – Parmesan Spaghetti Squash with Pine Nuts & Tarragon! The first time I saw cooked spaghetti squash separate into noodle-like strands I was mesmerized. Us humans love noodles, and Nature somehow created a squash that looks like noodles! I mean, how cool is that?! My fascination with spaghetti squash has inspired me to try to perfect it. The truth is, though, cooking spaghetti squash can be tricky. Almost every recipe and tutorial out there calls for cooking it cut side down or even whole in the microwave or slow cooker. The problem with all of these methods is that they steam the spaghetti squash. While that can sometimes result in perfectly cooked spaghetti squash, it’s not a fool proof method. Think about steaming vegetables. Cook them for the ideal amount of time, and you get perfectly al dente vegetables. Go even one minute over that “ideal” amount of time, and your vegetables get mushy. The same goes for spaghetti squash. Steaming it requires precision. Cook it too long, and you get a soggy mess instead of squash that magically looks like noodles. So what’s the solution, you ask? Roasting. Again, think about what roasting does to vegetables (and most foods, for that matter). The excess water cooks out and the edges caramelize, resulting in great flavor and texture. The same thing happens with spaghetti squash. When it’s roasted cut side up at a high temperature, the excess water cooks out and the spaghetti squash caramelizes, resulting in lots of flavor and squash “noodles” with enough texture to hold up to any sauce. A big thank you to Katie over at Chocolate Covered Katie for realizing this. You can check out her post on it here! With a fool-proof method for cooking spaghetti squash under my belt, I’ve been experimenting with all sorts of flavor profiles. Search Pinterest and you will find Italian, Mexican and Asian flavors. Spaghetti squash can be used as a healthy, low-carb substitute for all sorts of noodles! One of my favorite ways to eat spaghetti squash is with bacon, blue cheese and buffalo sauce, a recipe you can find here. 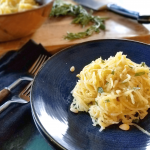 In this recipe for Parmesan Spaghetti Squash with Pine Nuts and Tarragon, I keep it simple. However, the flavors used in this dish are huge and come together as powerfully as Beethoven’s 5th Symphony! Of course, the ingredients in this recipe are also nutritious. Spaghetti squash is a great choice for a winter vegetable since it’s harvested in the fall and keeps for months in storage. It’s also a delicious and nutritious low carb alternative to noodles! In addition to fiber, spaghetti squash provides a little bit of almost every essential vitamin and mineral, including more potassium, vitamin A and vitamin C than regular pasta (source). Potassium is an electrolyte essential to maintaining the body’s fluid balance, and vitamin A and C do everything from acting as antioxidants to keeping the eyes healthy and maintaining healthy skin. Spaghetti squash does all of this with very few calories and carbs! As a type of hard cheese, parmesan provides protein, calcium, phosphorus, and the vitamins B12 and riboflavin (source). Protein helps your body maintain steady blood sugar levels and is used to make everything from neurotransmitters to skin and bones. Calcium and phosphorus also help to keep bones and teeth strong, while B12 is essential for the nervous system. Riboflavin (B2) is also essential for the nervous system and converting carbohydrates into energy. Pine Nuts have been cultivated for 10,000 years and prized for their nutritional value. They contain notable amounts of potassium, protein, iron and the B-complex vitamins as well as impressive amounts of magnesium, phosphorus, zinc, vitamin E and vitamin K. Pine nuts also provide ample amounts of monounsaturated fats and the antioxidant lutein. Whew, that’s a long list! As you can imagine, these tiny powerhouses offer a long list of benefits to the body. The protein and healthy fat both help your body keep blood sugar levels steady and help you feel satisfied after a meal, both of which are essential for maintaining a healthy weight. Research has shown that healthy fats, potassium, magnesium and vitamin E all contribute to keeping the heart healthy, and protein, zinc, phosphorus and vitamin K are all needed for healthy bones. Lutein helps to keep the eyes healthy, and some of the nutrients in pine nuts have also been linked to a lower risk of cancer (source). Pine nuts are indeed small but mighty! Pine nuts are a hard act to follow, so I’ll just say that the remaining ingredients have benefits to offer, as well. Avocado Oil, for example, is also a source of those heart-healthy monounsaturated fats. Together, all of these ingredients come together to create a dish that’s full of vegetables and nutritious as well as low in carbs, making it compatible with low-carb and ketogenic diets. This Parmesan Spaghetti Squash with Pine Nuts and Tarragon is also gluten-free and grain-free. Plenty of healthy fats and tons of flavor make this dish super satisfying, as well! Amazon links to products are included below as part of my helpful hints. Some of them are affiliate links, which means that I may receive a small commission if you purchase a product through one of my links. Thank you for supporting Taste Abounds! Grana Padano cheese is a type of Parmigiano-Reggiano, which technically is classified as a type of Parmesan. Why do I say this? Because “Parmesan” is a translation of “Parmigiano-Reggiano”, and as such, both names are regulated in Europe. Any cheese called either Parmigiano-Reggiano or Parmesan in Europe must meet strict requirements, most notably where the cheese was made and how long it was aged (source). Here in the United States, there are no regulations for the name “parmesan”. So, long story short, Grano Padano is a type of Parmesan cheese and my favorite by far. If you’ve ever spent a lazy Saturday watching PBS cooking shows, like I did in my pre-kid days, you have probably heard of Grana Padano cheese. Lidia Bastianich uses it in her recipes often. In fact, I have Lidia and PBS to thank for introducing me to Grana Padano cheese! Grana Padano cheese can be difficult to find. Thankfully Trader Joe’s sells it for a very reasonable price! You may be able to order it from other health food stores, but I was told that Whole Foods doesn’t offer it anymore since it’s a type of Parmigiano Reggiano. Um, apparently they’ve never done a side-by-side tasting to compare Grana Padano to regular Parmigiano Reggiano. I did, and I was astonished by the difference! Grana Padano is far more fragrant with the flavors it embodies, which are so much more fruity and buttery than regular Parmesan. I don’t have the words to tell you how good – and how perfect – it is with the tarragon in this recipe! If you can’t get your hands on Grana Padano cheese, fear not. This recipe is also fantastic with Parmigiano Reggiano. Just be sure to get a high quality Parmigiano Reggiano cheese, and consider grating it yourself or asking the store to grate it fresh for you since it fresh grated cheese will have the best flavor. Spaghetti squash is one of the most difficult vegetables to cut, and doing it safely requires a good, sharp knife. I own J.A. Henckels knives and use this chef’s knife to cut spaghetti squash. I’ve been using J.A. Henckels knives for years, and they will probably last several more decades. They are very sharp, high quality knives at a relatively affordable price! The line of J.A. Henckels knives I own are shown above, but there are other great knives out there. I’ve heard good things about Chicago Cutlery and Cutco knives, but I can’t speak to their quality from personal experience since I’ve never owned them. Cutco is only sold in certain places, but Chicago Cutlery is widely available and very affordable. You can check them out below. Hopefully now you know everything you need to know to make this recipe. Check out the video below and keep scrolling down for the recipe! This flavor combination will blow you away! 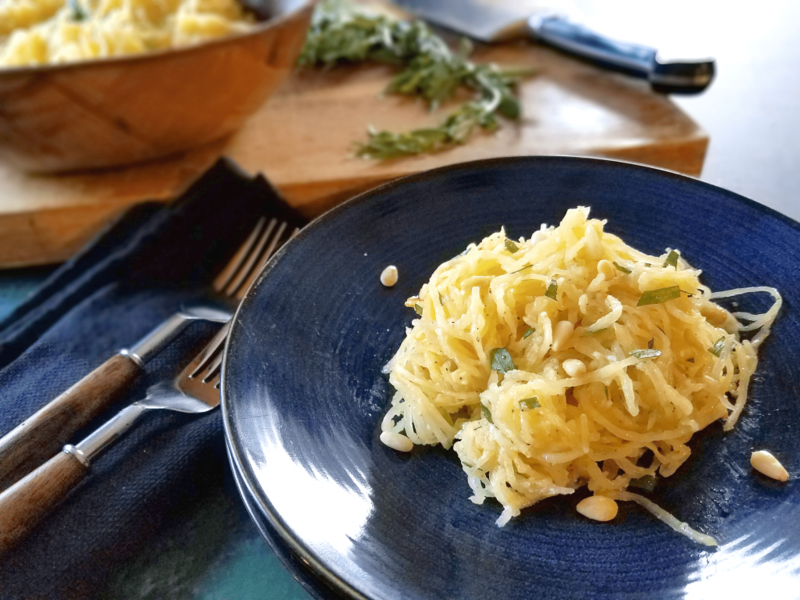 Buttery and fruity parmesan cheese (ideally Grana Padano) is the perfect companion for tarragon and pine nuts, and it's all mixed together in a healthy, gluten-free and low-carb spaghetti squash dish! Preheat oven to 450 degrees Fahrenheit (425 for convection oven). Cut the spaghetti squash in half crosswise (or lengthwise, if you're feeling brave). Scrape out the seeds and arrange cut-side UP on a sturdy pan. Roast at 450 degrees for about 40 minutes (425 for 30 minutes for convection ovens). Remove and use a paper towel to carefully soak up any water that has pooled in the center of the squash. Set aside. Add the avocado oil, lemon juice, salt and pepper to a small jar. Secure the lid and shake until well combined. Alternatively, you could wisk the ingredients together in a small bowl. Use a hot pad to hold the spaghetti squash and a fork to pull the squash into strands. Transfer to a large bowl. Pour the sauce and grated cheese over the spaghetti squash and mix to combine. Add the tarragon and pine nuts and mix again until all of the ingredients are well distributed. Garnish with a pinch of pine nuts, grated cheese or chopped tarragon, if desired. I hope you enjoy this dish!